Conceptualized, designed, engineered and manufactured CIP systems by Alfa Laval, the tank cleaning experts. When cleaning tanks, the solution starts with the tank, not your plant infrastructure. With an Alfa Laval cleaning machine, your tanks will be cleaned in the most efficient, effective and verifiable manner. To support this revolutionary technology, you do not need to install an expensive CIP cleaning system and incur all of the infrastructure costs associated with installation and plumbing. Alfa Laval's MCIP series provides optimal cleaning performance by delivering the required pressure and flow for efficient tank cleaning at a fraction of the cost. Each system is tailored for your specific needs, based on your tank cleaning application. 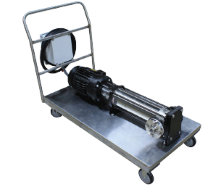 Cleaning tanks begins with choosing the proper tank cleaning machine(s). Therefore designing a CIP system needs to follow the selection of the appropriate tank cleaning method, not the other way around. Providing the proper CIP system to power the Alfa Laval tank cleaning maching will guarantee an efficient and thorough cleaning process for your tank cleaning requirements. As tank cleaning specialists with decades of experience in tank cleaning, Alfa Laval can provide you with the best tank cleaning solution from start to finish. Regardless of the tank cleaning application, Alfa Laval can provide an engineered solution. The comprehensive list below defines the standard features for each MCIP system model. Additional features such as multiple storage tanks, unique filtration, dosing of chemicals, rapid heating of wash fluid or multiple saved cleaning programs for each vessel can then be added to the model. Step 1: Find the right Alfa Laval tank cleaning machine for your application. Our tank cleaning experts work with you to select the most efficient and effective cleaning machine based on your unique application. Each Alfa Laval MCIP system begins with a standard model, based on the complexity of the application. Once the model type is selected, additional features are added to customize the system to your specific needs. Designed together, the end result is a unique mobile cleaning system for your application.